Gin joined NRG in 2010 and has been a core part of the A team ever since. Gin also has a ton of international experience under her belt as a former Team Wales skater, having participated in the Blood and Thunder World Cup in Dallas in 2014. Gin loves all things derby – playing derby, coaching derby, watching derby, and when she’s not doing that, she’s talking about derby. What Gin doesn’t know about the derby community and the latest tactics and strategies, isn’t worth knowing. She is a double threat, skating internationally as a jammer/blocker and doing the same on her home turf with NRG. She can talk to you about rankings and how to make sure your match ups are working as hard as you are in terms of getting your league where you want it to go. Gin can teach you about catching and containing the jammer, wall structures, and crazy footwork! 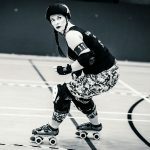 She can also help you expand your tool box of skills whether that is as a jammer or as a blocker, giving you the building blocks for effective pack work.